Trilby Station, on the Darling River Run, is located on the western bank of the Darling River twenty kilometres downstream from Louth and one of the best farmstays along the Darling River. A fifth generation working sheep station, it provides outback visitors with farm-stay accommodation ranging from river & billabong campsites to very comfortable converted shearers' quarters and cottages. Trilby Station makes a perfect stopover when doing the Darling River Run, and is located on the western side/route of one of the most iconic Outback NSW touring routes. The property, spans over 320,000 acres and is set beautifully on the banks of the Darling and is synonyms with the history of Outback NSW and the river. Historically, as Dunlop Station, Trilby Station was the site of Australia's first mechanised shearing shed; the transition from hand-shears to mechanical ones was not well received by many and it provided the backdrop for the song 'Click Goes the Shears' and the event of the great shearers' strike of 1891. The mechanised transition of shearing was made possible by the introduction of the Wolseley shearing machines. Today, Trilby is regarded by many as one of the best camping and farm-stays not only on the Darling River, but Outback NSW, and through the dedication of owners, Gary and Liz Murray, the history of life on the river is well preserved and told through many interpretive experiences; in particular the historic homestead. Trilby Station is also the founding member of Outback Beds, which is a group of accommodation providers located throughout Outback NSW and Queensland that offers accommodation options ranging from B&B's, Farmstays, Motels, and bushcamping. It is a wonderful way to ensure people get the most out of outback travel, especially those new to remote travel. As they say at Outback Beds, Stay in the outback with friends. Other activities include fishing and yabbying, interpretive 'mud-map' driving tours to the original homestead, canoeing, as well as bushwalking and cycling. Louth, beautifully set on the banks of the Darling River is a small service town (Pub, fuel and general store) about 100km downstream from Bourke and 100km upstream from Tilpa. The town was originally established as a service point for the Cobb & Co coaches that serviced outback Australia. Today, it provides the perfect stopover (and river crossing) for the Darling River Run; an outback journey through NSW from Walgett to Wentworth on the Victorian/NSW border. The town of Louth was created when T.A Mathews established a Hotel to service the river trade and the Cobb & Co coaches that used it as a stopover. Louth is ideally located for access to the Darling River Run and affords a choice of eastern or western route along the Darling River downstream to Tilpa as well as the upstream section to Bourke and beyond. Once a year, this normally sleepy town is host to a classic country race meeting (the Louth Races) in August each year, with over 4,000 people attending the weekend race meeting. Louth also is the site of an amazing and emotive structure known as 'The Celtic Cross' - a 7 metre (24 ft) polished granite cross that dominates the cemetery on the hill overlooking the town. The cross was constructed by the founder of Louth, Thomas Matthews, who erected the monument as a perpetual memorial to wife, Mary Mathews, who died in 1866. Significant anywhere, the Celtic Cross is even more so here as it reflects the setting sunlight to the space where the front door of their house every year on the anniversary of her death on August 19. The monument is not only testament to the love and devotion of a husband for his wife but also the accuracy of navigation technology of the 1800's as its alignment was reportedly aided by one of the river boat captains of the Darling River. Anyone visiting Louth can observe the occurrence and the locals have thoughtfully marked the places throughout the year that the visitor can experience the 3 minute light show. 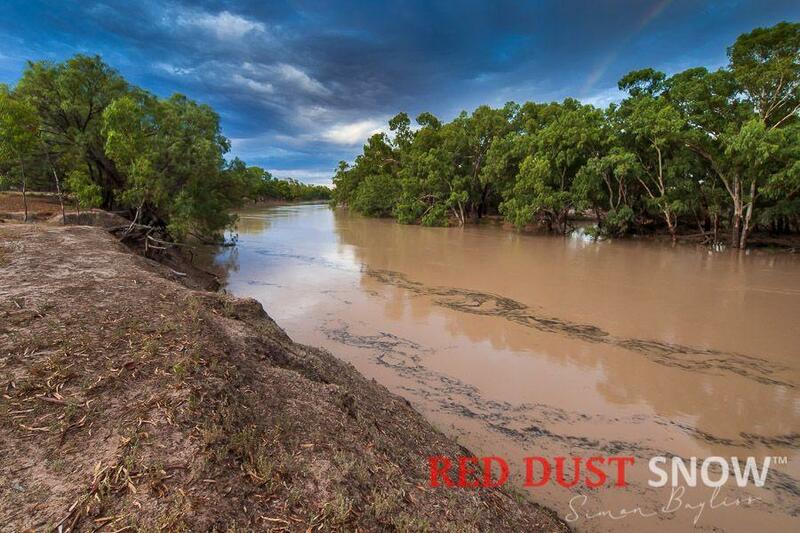 Louth is located about 1 hrs drive from Bourke (Dry weather road) and Trilby Station a further 20km downstream on the western side of the river. The Kidman Way, which starts at Jerilderie, is reached easily reached from Melbourne either via the Northern Highway to Echuca then the Cobb Highway to Deniliquin and then through Conargo to Jerilderie or via Shepparton and Tocumwal (Goulburn Valley Highway) then though Finley on the Newell Highway. The journey along the Kidman Way takes in Darlington Point, Griffith, Hillston, and Cobar before reaching Bourke. From Bourke, it is about 100km downstream to Louth, at which point you cross over the Darling River (But do stop in Louth) and then a further 20km downstream from Louth. The drive from Sydney to Bourke allows the traveller to also visit the Blue Mountains before continuing west through Bathurst, Orange and Dubbo before joining the Newell highway as far as Gilgandra, then the Castlereagh Highway continues the journey to Walgett via Coonamble. Getting to Bourke from Brisbane is easily done in a day and takes you through the wonderful Lockyer Valley and up over the Great Dividing Range to experience the icon Toowoomba via the Warrego Highway. From Toowoomba, the route continues along the Warrego to Goondiwindi and across the border into NSW and onto Moree before joining the Mitchell Highway. Continue along the Mitchell to Walgett and then it is a matter of following the Darling down to Bourke. From Bourke, it is about 100km to Louth then across the river for another 20km to Trilby Station. Driving from Adelaide to Bourke starts with a nice easy run along the Barrier Highway via Broken Hill and joining the Darling River Run at Wilcannia. From Wilcannia, there are two possible routes along the Darling River Run. Firstly, the western side of the River will take you through Tilpa and then Trilby is 20kms this side of Louth (Well sign-posted). Alternatively, the eastern route will take you along the opposite side of the Darling from Tilpa but the river is bridged and a stop at Tilpa is a must to experience one of the most iconic pubs in Australia. Once on the western side of the river, the route can continue on this side whereby Trilby Station is 20km this side of Louth. If wanting to take the eastern side of the river, which goes through Louth, simply cross back onto the eastern side of the Darling after stopping in Tilpa, head up to Louth, less then 100km, then after stopping in Louth, simply cross back over the Darling and head downstream 20km to Trilby Station.